Joshua Franco (left) and Oscar Negrete fought to heated draw in their entertaining first bout. Their rematch co-headlines the April 25 Thursday Night Fights. 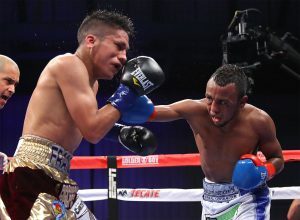 Bantamweight standouts Oscar Negrete and Joshua Franco will square off in a much-anticipated rematch on April 25, Golden Boy Promotions recently announced. The 10-round bout will take place at the Fantasy Springs Resort Casino in Indio, California. In the main event, another rematch will take place as junior welterweight fringe contender Yves Ulysse will face Steve Claggett in a 10-round bout. Both fights will headline the new “Thursday Night Fights” series, which streams live on RingTV.com, and is also broadcast live and on a tape-delay basis on several cable systems across the U.S.
Negrete and Franco squared off last October, producing one of the best-action fights of 2018. The evenly-matched fight between the two Golden Boy Prom0tions fighters ended in a split-decision draw. Both fighters believed they did enough to win. Negrete (18-1-1, 7 knockouts), originally from Colombia and now residing in the Los Angeles suburb of Rosemead, suffered his only defeat at the hands of WBC junior featherweight titleholder Rey Vargas in December 2017, losing by unanimous decision. The 31-year-old volume puncher is currently ranked No. 6 by the WBC. Franco (14-1-1, 7 KOs) suffered his only defeat as a pro at the hands of Lucas Fernandez Leone last March. Franco was ahead on two judges’ scorecards early in round nine when he was stunned by a punch from Fernandez Leone, prompting referee Jose Hiram Rivera to immediately (and controversially) stop the fight. Franco, who is originally from San Antonio and now resides in Riverside, where he is trained by Robert Garcia. Ulysse and Claggett, who are co-promoted by Golden Boy Promotions and Montreal-based Eye of the Tiger, will square off in an all-Canada battle. Both squared off in October 2017, with Claggett winning a close split-decision in Ulysse’s hometown of Montreal. The 30-year-old Ulysse (17-1, 9 KOs) last fought on the December 15 Canelo Alvarez-Rocky Fielding undercard, dropping Max Becerra twice en route to a unanimous decision victory over eight rounds. He has won his last three fights since the loss to Claggett. Ulysse is ranked in the top 10 in three of boxing’s sanctioning bodies. Claggett (27-5-2, 17 KOs), who resides in Calgary, fought to a split-decision draw in his last bout on January 26 against unbeaten Mathieu Germain. Also fighting on the Golden Boy Promotions card is unbeaten welterweight prospect Alexis Rocha, the younger brother of contender Ronnie Rios. Rocha (12-0, 8 KOs) will face Mexico-based Japanese gatekeeper Shoki Sakai (23-9-2, 13 KOs) in a 10-round bout. Flyweight contender Marlen Esparza (5-0, 1 KO) and junior welterweight Mike Reed (23-2, 12 KOs) will also appear on the card in separate bouts.